Rainmaker designed a program ad targeting soccer fans at the 2015 Dallas Cup. As one of the host cities, the Town of Addison wanted people to know Addison is the place to be! 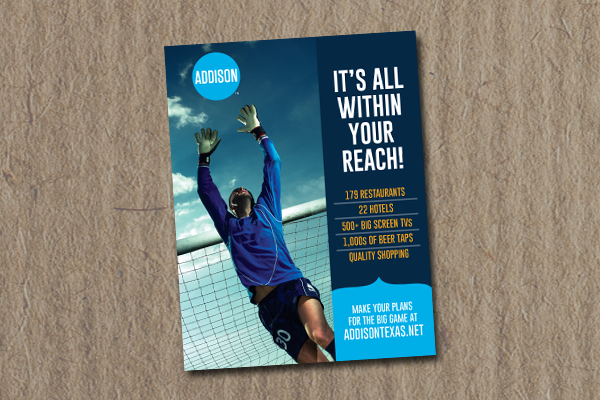 “It’s All Within Your Reach!” tells the exact message the Town of Addison wanted to get across, while relating it to even the most devoted soccer fans. The visual uses the shape of the actual soccer ball to reinforce the circular shape of the newly introduced Town of Addison logo.